Portable Shear and Rod Cutter can be vice or bench mounted. Weighing 17 lb, No. 1 Portable Shear has offset frame constructed to permit shearing of wide sheets, straight cuts, or outside curves. Blades are made of tool steel and can be removed for sharpening. With 1/8 in. mild steel shear capacity and 5/16 in. mild steel rod-cutting capacity, product features 24 in. handle mechanism that works in compound fashion to facilitate cutting. 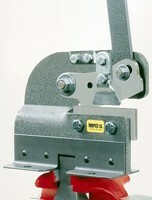 Special latch is hinged to allow vise mounting or bench mounting. Cutting Tools cut carbon fiber strip, rod, and tube.